500 Gallon (1,900 liters) tank designed specifically for long-term storage of wine, cider, mead and other beverages. Tank comes standard with an VF4 bottom flange (10 hole 4″ flange fitting – 4″ 10 Bolt Fitting, 4″ Tri-Clamp, 4″Tri-Clamp Gasket, 4″ Tri-Clamp Blank), a RP2VF (2” Tri-Clamp Racking Flange Mount Racking Port Kit), SV1T (SV1T Tassilini Sample Valve) and FL2 (Fermentation Lock). Pair this with our P48 reinforced pallet to protect the tank long term (Pallet sold separately). 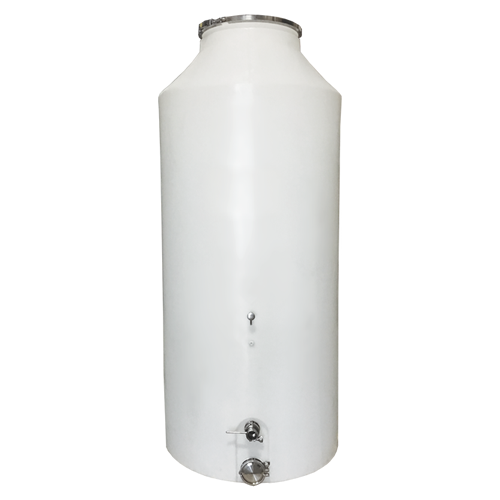 The tank height at 93″ tall and at 42″ in diameter, the tank has the correct aspect ratio and our Dexter lid system which purges all of the 02 from the tank when topped off.